Given below are several comments made by prominent people concerning the engineering profession? They are truly enlightening. Take a look. — James Dyson, inventor and founder of the Dyson Co.
-– Steve Jobs, co-founder of Apple Inc.
-– Mindy Kaling, actress, comedian. Gordon Moore, co-founder, chairman emeritus, Intel Corp.
-– Steve Wozniak, computer engineer and co-founder of Apple Inc.
-– H.G. Wells, author of The War of the Worlds, The Time Machine, and The Invisible Man. If you have read any my previous postings you know that most of my work is dedicated to subjects involving the STEM (Science, Technology, Engineering and Mathematics) professions. I do follow engineering education and renewable energy quite closely. Recently I read about a company called Pavegen Systems. 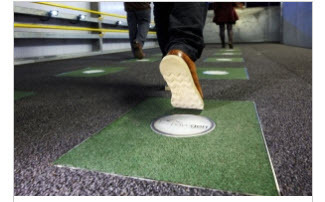 This company “invented” a remarkable and innovative system of providing energy by turning the pressure generated by footsteps into voltage that can be stored and used for various purposes. The basis for the technology involves Pavegen tiles. The JPEG shown below will give some idea as to how the system operates. The first JPEG shows the disk embed representing the heart of the system. Pavegen tiles are embedded into flooring just as any tiles would be. The pressure exerted by a 150 pound man, 112 pound woman, etc is used to charge batteries which drive mobile devices, lighting, power Wi-Fi systems, etc. A proprietary system is used to convert kinetic energy into voltage which is stored providing for a multitude of uses. 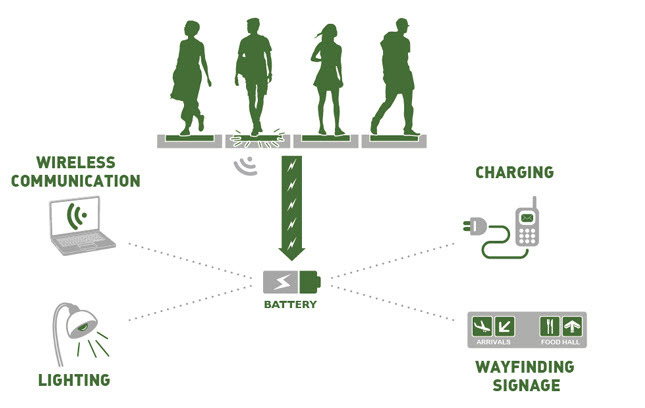 Every time someone walks over a Pavegen tile, renewable energy is harvested from the footsteps. Pavegen is an innovation company head quartered in London. 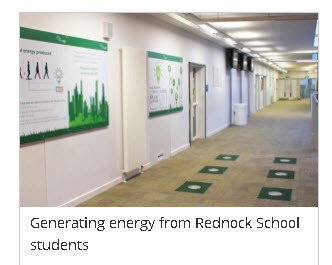 This company develops and manufactures flooring technology that converts the wasted kinetic energy from human footfall into renewable electricity. This clean tech energy source can power applications such as lighting, signage and communications networks in both indoor and outdoor environments of industries. The graphic below will indicate the possibilities for use. The top surface of the flooring unit is made from 100% recycled rubber while the base of the slab is constructed from 80% recycled materials. The system can be simply retrofitted in place of existing flooring systems as well as specified for new developments. The tiles are designed to withstand harsh outdoor locations with high footfall with each slab being waterproof to allow operation efficiently in both internal and external environments. The concept of Pavegen was developed in 2009 by Laurence Kemball-Cook, while researching kinetic-off grid energy solutions at Loughborough University. Since the company’s inception, Pavegen has independently embarked on a journey to become the market leader in the footfall energy harvesting sector, generating substantial global press coverage and public interest, with a series of commercial installations underway. Several of these existing installations are 1.) Simon Langdon School, 2.) Rednock School, 3.) West Hamm London Olympics and 4.) Several installations in offices in central London. The technology is proven and energy is harvested on a continuing basis. This post is a little different from the “technology” postings I normally provide. September and October have been a tough months for my family. My mom died on 13 October 2013 at 0904. Her funeral was yesterday. At the funeral, the pastor officiating had the following story. Hope you enjoy this one. The pastor received a call from a member of his church asking that he come over for a visit. The lady calling was definitely a senior citizen: a senior citizen who remained very independent and optimistic so the request was somewhat surprising. He indicated he would be over in about an hour. PASTOR: Hello there, you’re looking well and it’s a pleasure for me to see you again. Sometimes after services on Sunday I don’t get to speak to all of our members. I certainly hope all is well. LADY: Yes, I’m feeling well but quite frankly, I’m in the process of making plans for the funeral I know I will need in a few years if not a few months. The pastor was somewhat shocked and saddened to hear her reply but not that surprised since it is quite common for ageing individuals to make such plans. PASTOR: I think you are most kind to specify the arrangements you wish. It removes a burden from your children as well as all of the guess-work they would certainly have. LADY: As I lie there in the casket, I want the Bible in my left hand and a dinner fork in my right hand. Just like that! LADY: Yes a common dinner fork. One from my kitchen. PASTOR: OK, I certainly understand the Bible but please explain the fork. LADY: Have you ever been to a really great dinner? I mean one that is truly memorable? As the host is picking up the empty plate he or she will say—“save the fork”! You know at that moment the last course will be something special. I don’t mean pudding or ice cream but something you can really put your teeth into. Something solid. Something that truly surpasses the courses that have come earlier. As you stand there by my casket, I want you to tell those passing by that what’s to come is the best course. An experience far beyond and far greater than all we have experienced on this earth. Something you can really put your teeth into. Tell them to “SAVE THE FORK”. NOTE: Due to a lengthy illness of a beloved family member, I have been out of “action” lately. Now getting back into the swing of things, I thought I would re-blog a post I wrote about one year ago. Same song—different verse. See if you remember this one. “All things old are new again”. We use the word trillion dollars as though it was absolutely commonplace and every day language; so much so that everyone must have one, be happy to give you a loan, I have plenty more where that came from. In reality, most of us will never see a million dollars much less a billion and certainly not a trillion. The trillion dollar figure is very much associated with our US deficit and our national debt. Just this week, we read about Congress “needing” to raise the debt ceiling another $1.8 trillion to keep the FED operating. The thought is they will ask now to avoid having to ask prior to the 2010 elections. That wouldn’t look good at all would it? $1.8 trillion dollars—absolutely ridiculous! Do you really know how much a trillion is? Let’s take a look at some numbers. If you spent 1 million dollars per day, beginning the exact day Jesus was born, you would still have 726 years before you spent it all. Really big number right. Our Federal deficit is $1.4 trillion dollars. Our national debt is (are you ready for this one?) is $12,103,309,193,440.45. Don’t forget the $0.45. The IRS will chase you down for that. Twelve trillion eggs would weigh a little over thirteen million tons. Twelve trillion gallons of milk would easily fill Lake Superior—four times over. Last year, the interest on $12 trillion was a mere $385 billion dollars. Some economists say that our total debt, due to unfunded liabilities; i.e. social security, Medicare, medicade, food stamps, etc, is approximately $100 trillion dollars. Do you now whose picture is on a trillion dollar bill? YOU’RE GRANDKIDS AND YOUR GREAT GRANDKIDS. Isn’t it about time Congress calls a halt to the spending and the bleeding? Do you know that there are over 5,000 “earmarks” in the newly proposed health care bill? What if we changed our Constitution so that we had permanent representation—FOR LIFE? Incumbents forever !!!!!! No more pesky opponents, no more campaigns, no more fund-raising, no more lying to get our vote, no more kissing up to special interest groups for their campaign donations. There would be no real need for party affiliation. No need to “bring home the bacon”. Would this situation create a reduction in spending? Quite frankly, I think not. It is time to THROW THE BUMS OUT! Let’s start all over. Let’s air out the halls of Congress. Surely there are men and women with a modicum of integrity left in this country who would be willing to serve their fellow man.